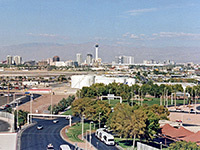 Chain lodging in south Las Vegas is concentrated along Paradise Road, which parallels the Strip (Las Vegas Blvd) a mile or so to the east, and leads south to McCarran International Airport. Also along here are University of Nevada, Las Vegas Convention Center and several shopping complexes, but most buildings are hotels, ranging from five star resorts to budget priced, exterior corridor properties. The northern reaches of Paradise Road are served by the Las Vegas Monorail. Other accommodation in the area is available at the Tropicana Avenue and Russell Road exits of I-15, just one block from some of the big casinos. Show Las Vegas Hotel Map (opens in new window). See also the listings and map for Las Vegas Casinos. Guests at the four star Renaissance Las Vegas along Paradise Road have a choice of over 500 luxurious, modern rooms and suites, in a stylish boutique hotel that also contains a steakhouse restaurant, cafe, lounge/bar, gift shop, full service business center and 20,000 sq ft of event space. The hotel has an excellent location right next to the Las Vegas Convention Center, opposite Wynn Golf Course, and less than a mile from the Strip, along Desert Inn Boulevard. There is a beautiful outdoor pool area at the rear, with hot tub and sun deck, and a 24 hour fitness center inside. The Las Vegas Monorail runs right past, nearest stop (Convention Center) just 700 feet away. Although catering mainly to the timeshare market, the 768 rooms and villas at Marriott's Grand Chateau are also available to rent for short stays, and they offer a very high standard of comfort and facilities - the 1, 2 or 3 bed villas include a fully-equipped kitchen, laundry, 42" TV & DVD player, luxurious bedding and separate areas for living & dining. The elegant, Mediterranean style hotel towers 38 stories above Harmon Avenue, half a block east of the Strip and a short walk from such nearby casinos as Planet Hollywood, Monte Carlo and Bellagio. On site amenities are a pool, bar, fitness center and gift shop. The all-suite, full service, 17 story Las Vegas Marriott enjoys a relatively peaceful location between Paradise Road and the Strip, bordered by apartments to the south and a huge parking lot to the north, with Riviera Casino on the far side. Las Vegas Convention Center and the nearest monorail station are both just 1000 feet away. The 278 beautifully decorated accommodations feature luxury bedding, quality furnishings, sofa beds, refrigerators, and long distance views across the city. The onsite restaurant is the American-themed Cafe 325, open for breakfast, lunch and dinner. Leisure facilities are the usual outdoor pool, whirlpool and fitness center. Six meeting rooms are available, largest capacity 275 people. Formerly part of Planet Hollywood, the new Elara timeshare hotel opened its doors May 2012, welcoming guests to this sleek, modern, 52 story building along Harmon Avenue, 0.3 miles from the CityCenter development along the Strip. The residential style accommodations include suites with fully equipped kitchens and one, two, three or four bedrooms, all with fantastic views of the surroundings. Leisure facilities are a landscaped pool area with multiple spas, cabanas and a poolside bar, plus a large fitness center and a concierge service to arrange for show tickets, restaurant bookings and other entertainment. On-site dining is available from the Lobby Bar, open until midnight weekdays, later on weekends. At the rear of the Flamingo casino, adjacent to the monorail station, Hilton Grand Vacations Suites is a resort-style complex of several mid-rise accommodation towers overlooking a spectacular, secluded garden area with hundreds of palm trees, plus swimming pools, fountains, waterfalls and sports courts. Regular rooms are available (amenities include a wet bar & sofa bed), but many guests stay in a suite, which have studio, one bed or two bed layouts, all equipped with a full kitchen; prepared meals can be purchased from the Desert Garden shop/deli. Other dining options are provided by the Flamingo, including a poolside bar. Wi-fi and self-parking are complimentary. The Hilton Grand Vacations Suites along Karen Avenue occupies an L-shaped building giving views in all directions; east across a golf course and estate, south to the LVH Hotel (formerly Hilton), west towards the Strip and north to the Stratosphere. The residential-style hotel is 0.2 miles from the Sahara station on the Las Vegas Monorail, enabling easy travel to area attractions. Accommodations comprise standard rooms with kitchenette and suites with two bedroom, one bedroom or studio layouts, all featuring a full kitchen and sofa bed. At the rear of the hotel, away from the main road, is a palm tree-lined outdoor pool with bbq grills and al fresco dining area. Other facilities include a games lounge, fitness center, business center and deli. The twin accommodation towers of Hilton Grand Vacations Suites on the Las Vegas Strip together contain 1228 rooms, most with fantastic views over the relatively open surroundings, the only other tall structure nearby being the unfinished Fontainebleau Resort directly opposite. The upscale hotel has a northerly location on the Strip, between Circus Circus and the Stratosphere, 4 miles from McCarran International Airport. Guests can choose from studio rooms with wet bar, 723 sq ft one bedroom suites and 1,083 sq ft two bedroom suites, these latter featuring a full kitchen. Two onsite dining outlets are the Marketplace Deli (selling drinks, snacks & cookable meals), and a poolside bar/grill. The rear of the hotel conceals an extensive tropical garden with a large swimming pool and other leisure facilities. DoubleTree Club Las Vegas is one of the few hotels on the south side of the international airport, at the edge of a nondescript business park by the Warm Springs Road exit of I-215. The terminals, and the nearest large casino (Mandalay Bay) are both 3 miles away. A 24 hour shuttle is available, serving the airport, the monorail and the MGM Grand. There are several restaurants within walking distance, and two on-site: a cafe providing breakfast & lunch and a lounge/bar open for dinner & evening drinks. The oversized guest rooms are equipped with quality furnishings and luxury bedding, and have good views over the quiet surroundings. The meeting space can accommodate events of up to 80 people. The immediate surroundings are relatively quiet and peaceful, but Holiday Inn Club Vacations Las Vegas is just half a mile from the Strip, the nearest large casinos being Bellagio, Caesars Palace and Flamingo. Other locations within one mile are Boulevard Mall, Las Vegas Country Club, University of Nevada and Las Vegas Convention Center, all within range of the complimentary shuttle service. Accommodation consists of 1 or 2 bedroom villas, up to 1,490 sq ft in floorspace, divided onto many three floor blocks surrounded by walkways and gardens, including five main swimming pools. All villas have a full kitchen, gas fireplace and washer/dryer. On-site dining is provided by Gold Mine Pool Bar and Grill (open for breakfast, lunch & dinner); other facilities include a games room, activity center, fitness center, putting green and convenience store. Courtyard by Marriott Las Vegas South is a clean, new, well kept building that receives good guest reviews on account of its attentive staff, quiet location annd comfortable bedding. The four floor building contains 146 rooms, many with views either northwards towards the casinos of The Strip, or south over the hotel's pool/garden area. The on site Bistro restaurant serves breakfast, cocktails and evening snacks - for other dining options there are plenty of restaurants 1.5 miles or more away along Las Vegas Boulevard, which is reached by free shuttle. Las Vegas airport is 4 miles east. Of the three Courtyard hotels in Las Vegas, the most central is located at the corner of Paradise Road and Desert Inn Road, directly opposite both the huge Las Vegas Convention Center and Wynn Golf Course. The Strip is half a mile west - the nearest casinos are Wynn Las Vegas & Treasure Island - with other places reachable via the Las Vegas Monorail, which stops just outside the Courtyard. The hotel has a nice pool/garden area at the center, away from the main road, plus a Jacuzzi, fitness center and a cafe serving breakfast. Despite the busy surroundings, the rooms and grounds are quiet, and all areas are clean and well looked after. Residence Inn Las Vegas Airport is the fourth hotel of this extended stay brand to open in the city, and the southernmost, situated in a relatively quiet location along a side street just off Las Vegas Blvd adjoining the Las Vegas Outlet Center, 4 miles from the international airport. Shuttle service to the airport is complimentary, as are wi-fi, hot breakfast, evening social hours and a grocery delivery service. Suites are available in studio, one bedroom and two bedroom layouts, all featuring a fully equipped kitchen. The hotel also has a pool, fitness & business centers, and a small meeting room, catering for events of up to 32 people. The all-suite Residence Inn Las Vegas Hughes Center rises 11 stories over the mixed residential/business district along Flamingo Road, a mile east of Las Vegas Boulevard; the nearest major casinos are Caesars Palace, Bellagio and Bally's. Guests have an excellent choice of restaurants, with over 20 outlets a short walk away, though free breakfast buffet is available in the hotel, plus a free evening reception. Leisure options are a good sized outdoor pool, hot tub and fitness center, while for those here to work, facilities comprise a business center and 4 meeting rooms - 1,800 sq ft of space. The southernmost of three adjacent Marriott hotels beside exit 36 of I-15 caters more to the extended stay traveler - the Residence Inn Las Vegas South has 160 suites featuring full kitchens, in two adjacent 4 floor blocks either side of a sizeable tropical garden area, at the center of which is a large pool with palm trees and a waterfall. The other main amenities are a sports court, exercise room, library, hot tub, free full breakfast, and a free shuttle taking guests to the Mandalay Bay Casino, just the other side of the interstate. The hotel is one of the top rated hotels in town, for its facilities, location, cleanliness, and the excellent staff. As is often the case, the Residence Inn Las Vegas Convention Center sits next to another Marriott property (the Courtyard), directly opposite the vast Convention Center complex and just up the road from the Hard Rock Casino. Despite the busy surroundings, the hotel has a quiet atmosphere, its 192 suites distributed over several separate blocks surrounded by lawns and mature trees. Rooms have a full kitchen and an extra sofa bed; the inn offers free full breakfast and a free light dinner, plus of course an outdoor pool. Guests can reach the Strip either on foot (0.7 miles to Wynn Las Vegas) or by the monorail, which stops right outside the Residence Inn. The upscale, boutique accommodations at Bluegreen Vacations Club 36 comprise 275 colorfully-decorated, art deco style suites with such amenities as a microwave, refrigerator, DVD player and sofa bed. There are two restaurants on site, plus a large indoor pool, fitness center and sundeck. The property has a quiet, rather isolated location surrounded by undeveloped land, yet is one of the closest hotels to the international airport, just over one mile from the terminals along Tropicana Avenue; the nearest major casino (MGM Grand) is half a mile west. Open summer 2008, the luxurious, all suite, 118 room Staybridge Suites Las Vegas caters for long stay guests or those needing extra facilities and comfort. All rooms feature a full kitchen, DVD player, large work desk and floor to ceiling windows allowing fine views towards downtown Las Vegas or distant mountain ranges to the south. An outdoor pool, fitness center, business center, gift shop and free hot breakfast are the other main amenities. The Staybridge Suites sits beside several Marriott hotels along Dean Martin Drive, just one mile from the southernmost casino on the Strip (Mandalay Bay), and right next to exit 36 of I-15. Half a mile south of Las Vegas Convention Center along Paradise Road, the Embassy Suites is an upscale, non-gaming hotel of 286 two-room suites, all featuring a bathroom, separate living area, refrigerator, microwave and wet bar. Rooms have views over the mostly residential surroundings, and west across Wynn Golf Club to the casinos on the Strip. The hotel's Fountain Grill Restaurant is open for lunch and dinner; freshly cooked breakfast is complimentary to all guests, as are the evening receptions where drinks & snacks are served - located in the floor-to-ceiling atrium lobby. Leisure facilities are a sundeck, indoor pool, outdoor hot tub and fitness center. 11,00 sq ft of meeting space caters for events of up to 250 people. The southernmost of two Embassy Suites properties in Las Vegas is situated just off Paradise Road adjacent to the University of Las Vegas; an imposing, six floor building centered on a tropical atrium lobby, with a sheltered, palm-lined pool area at the rear. Hard Rock Casino is just across the street, while the international airport, Las Vegas Convention Center and the Strip are all 1.5 miles away, reachable by complimentary shuttle. Both hot breakfast and evening receptions are complimentary; other meals are available from Three Palms Cafe in the lobby or from several nearby restaurants, at Paradise Esplanade one block south. The all-suite accommodations feature a living area, work desk, sofa bed, refrigerator, microwave and wet bar. The more central of two Homewood Suites hotels in Las Vegas is located along Dean Martin Drive, the western I-15 frontage road, in a generally industrial neighborhood, about half a mile from the nearest casinos (Aria/City Center). The international airport is 3.5 miles away. The hotel caters for the long stay traveller as well as short stay guests, offering all-suite accommodations in two bedroom, one bedroom and studio floorplans; all have a full kitchen and a sofa bed. Snacks and cookable meals can be purchased from the 24 hour convenience store. The hotel has an oversized outdoor pool complete with waterfall, and it provides both free hot breakfast and free weekday evening receptions. In a business park on the south side of Las Vegas International Airport, the Homewood Suites provides high quality, all-suite/extended stay lodging close to I-15 and I-215; accommodations are available in studio, one bedroom and two bedroom layouts, the largest 805 sq ft; all have a fully equipped kitchen with dishwasher and full-size refrigerator. Hot breakfast and evening dinner (Mon-Thu) are complimentary. A free shuttle is available to the airport and the southern end of the Strip. Other amenities include meeting space, a 24 hour business center, a fitness center and courtyard garden with outdoor pool. Two shopping malls within walking distance are Las Vegas Premium Outlets and Town Square Las Vegas. The second Hilton Garden Inn hotel in Las Vegas opened spring 2018, adding to the accommodation choices around the Tropicana Avenue exit of I-15; the hotel sits along the western frontage road, a one mile walk from the nearest large casinos (Aria, Monte Carlo, New York New York). The immediate neighborhood contains a mixture of business premises and other hotels, plus a few restaurants. A complimentary shuttle serves the international airport (2.6 miles) and the Strip. The hotel has its own restaurant (evening room service provided), plus a lobby bar. Drinks and snacks can also be purchased from a 24 hour convenience store. A meeting room accommodates events of up to 100 people. For recreation, the hotel offers a 24 hour fitness center, a hot tub and an outdoor saline pool. Hilton Garden Inn Las Vegas is one of the most southerly hotels in the city, located along Las Vegas Boulevard 3 miles from the nearest large casino (Mandalay Bay) and just down the street from Las Vegas Premium Outlets. The immediate neighborhood is quite lightly developed, including a half mile-wide strip of vacant land separating the hotel from I-15 to the west; access is from the Blue Diamond Road exit. The hotel has a nice sheltered tropical garden at the rear, centered on a pool and hot tub, and is surrounded by ample parking space. Breakfast and dinner are served at the Great American Grill Restaurant, while snacks and cookable meals (prepared using the in-room microwaves) can be purchased 24 hours a day from the Pavilion Pantry convenience store. A free shuttle is operated to the airport and Mandalay Bay. Hampton Inn Las Vegas has a good location at the Tropicana Avenue exit of I-15, convenient for people wanting just a quick stopover, but still within easy walking distance of the Strip, the four nearest casinos (one block east) being Excalibur, MGM Grand, Tropicana and New York New York. The hotel is larger than average, with 322 rooms & one bed suites, in a six floor building centered on a partly enclosed courtyard garden, complete with the obligatory palm trees and outdoor pool. Hotel highlights include free hot breakfast, a lobby lounge, a 24 hour business center, complimentary shuttle to the airport & other attractions, and 10,000 sq ft of function space. There are plenty of fast food restaurants close by. Open July 2019, the TownePlace Suites offers accommodations in two bedroom, one bedroom and studio floorplans, all equipped with a full kitchen. Hot breakfast and wi-fi are complimentary. The hotel has a southerly location in Las Vegas along Warm Springs Road on the south side of I-215, 4 miles by road from the international airport, served by courtesy shuttle. Most of the neighborhood consists of business premises, though there are several shops and restaurants nearby. Coin-operated laundry, an outdoor pool, bbq grills and meeting space are some of the other amenities. TownePlace Suites Las Vegas (open late 2018) has a prominent, easily-reached location right beside Interstate 15 at the Tropicana intersection (west side), a few minutes walk from such casinos as Excalibur, MGM Grand, Tropicana and New York New York. The immediate neighborhood is mostly business and industrial though there are a few restaurants close by. All accommodations are suites, and all have a full kitchen. Hot breakfast, wi-fi and parking are complimentary. The business and fitness centers are open 24 hours. The hotel also has an outdoor pool and a fire pit. SpringHill Suites Las Vegas Convention Center has 24 floors and 299 stylish, brightly-decorated studio suites, all featuring a refrigerator, microwave, HDTV, executive desk and extra comfortable bedding. Free buffet breakfast is prepared each morning, while dinner and evening drinks are available on-site at the Inspiration Lounge, or from several nearby restaurants. The hotel lies half a mile east of the Strip along Paradise Road, just across the street from Las Vegas Convention Center and less than a mile from Las Vegas Country Club. The Hyatt Place (open winter 2019-2020) is amongst the southernmost hotels in Las Vegas, built in a developing neighborhood along Dean Martin Drive, near the junction of Hwy 160 (Blue Diamond Road) and I-15, and within walking distance of the Silverton Casino and its associated shops & restaurants. There are 150 guest rooms available, all featuring a corner sofa bed, and including a selection of suites equipped with a full kitchen. The hotel has an oversized outdoor pool, 24 hour business & fitness centers, a cafe serving breakfast and a bar open for snacks and drinks. Other meals can be ordered from the Gallery Menu, available 24 hours. The Hyatt Place in Las Vegas is one of dozens of hotels along Paradise Road; towards the south end, one mile from the Strip (the nearest casinos are MGM Grand and Planet Hollywood) and three miles from the international airport. The UNLV campus is within walking distance to the east. The hotel is surrounded by plenty of parking space and has an outdoor, south-facing pool at the rear. A free shuttle serves the airport and the Strip; also complimentary are wi-fi and hot breakfast. The 202 guest rooms contain a refrigerator, coffee maker, sofa bed and work desk. A 24 hour market sells drinks, snacks and cookable meals. The Las Vegas South Holiday Inn Express hotel along Polaris Avenue is situated just west of I-15 (exit 36; W Russell Road) and half a mile from S Las Vegas Boulevard, The Strip, which intersects Russell Rd just south of the Mandalay Bay casino (linked to the Holiday Inn Express by free, half hourly shuttle). The hotel is well decorated and well maintained, offering 139 rooms & suites on 4 floors, in 2 blocks that enclose a large courtyard with many palm trees, outdoor pool, whirlpool and tennis court. Free hot breakfast buffet is served; for other meals, the nearest restaurants are in the casinos. With 276 fully equipped suites, the reasonably priced Candlewood Suites Las Vegas hotel has plenty of accommodation for long stay travelers, and quite a good location along Paradise Road, one block north of Flamingo Road. The Strip is a mile west, and also nearby are University of Nevada-Las Vegas, Boulevard Mall, Fashion Show Mall and the international airport. The closest interstate is I-15 exit 39. All suites contain a full kitchen, CD player and VCR, while the hotel has a convenience store, outdoor pool, whirlpool and health/fitness center. Close to Las Vegas International Airport but also serving the Strip, the Best Western McCarran Inn along Paradise Road (one block south of Tropicana Avenue) provides good value accommodation with clean & spacious rooms, a good location, and all the usual amenities - an outdoor pool, free continental breakfast, and a complimentary shuttle to the airport, the Las Vegas Convention Center and several of the major casinos. The Best Western is also one of the closest hotels to UNLV, with the Thomas & Mack Center just half a mile away. One of three adjacent Marriott hotels along Dean Martin Drive, just southwest of exit 36 of I-15 (Russell Road), Fairfield Inn Las Vegas South offers 142 rooms & suites, free hot breakfast, an exercise room, convenience store, outdoor pool and whirlpool. Las Vegas Boulevard is just the other side of the interstate, the closest large casino being Mandalay Bay, a 0.9 mile walk away, though this is also reachable by free shuttle. The Fairfield has an excellent reputation, for the customer service, cleanliness of the rooms and the wide range of facilities. Hotels along Paradise Road in Las Vegas provide generally cheaper lodging than the more famous places on the Strip, between 1 and 5 blocks west. Fairfield Inn Las Vegas/Airport is close to all the major sites including the Convention Center 0.7 miles north and Las Vegas Airport (2.3 miles south) - both served by free shuttle, which also reaches the Wynn Las Vegas casino. Also within a mile are University of Nevada-Las Vegas, and the Boulevard Mall. The hotel is a clean, modern building of 129 rooms, offering free hot breakfast, an outdoor pool, hot tub, fitness room, business center and two meeting rooms. Guests at Howard Johnson Las Vegas are less than half a mile from the Topicana Avenue intersection on the Strip, and just 800 feet from the MGM Grand station on the Las Vegas monorail, and so well placed for explorations of the surrounding casinos. Guest rooms are in two blocks, set back from the main road for a quieter night's stay, though the airport is close by to the east (2 miles by road). The pet friendly hotel has an extra large parking lot, with an outdoor pool at the front, and it provides free continental breakfast. The main attraction near Baymont Inn Las Vegas South is the Premium Outlets Mall just across the street; this has well over 100 stores including many restaurants. Mandalay Bay, the closest major casino on the Strip, is 3 miles north, while the international airport is 4 miles away; both are served by free shuttle. The slightly isolated location right on the south edge of the city means that room rates are comparatively low, but not at the expense of amenities, which comprise an indoor pool (open 24 hours), courtyard garden, fitness & business centers and meeting space. Free hot breakfast is provided each morning. Rooms are available with kitchenette, sofa bed and hot tub bath. Days Inn Las Vegas is conveniently located both for travelers along Interstate 15, which runs past just to the east, and visitors to the Strip casinos - the two closest are Excalibur and New York New York, half a mile east. The immediate surroundings are an uninteresting mix of parking lots, a truck stop and business premises but there are several restaurants nearby and one (Denny's) on the premises. The hotel also has its own 24 hour casino. Guest rooms are distributed amongst several intersecting, exterior corridor blocks, surrounded by a large parking area, which includes many truck spaces. Some have views over the outdoor pool, whirlpool and patio. Travelodge Las Vegas South is one of few non-resort lodging places right on the Strip, centrally positioned at the Harmon Avenue intersection, right opposite City Center/Aria. Entrance is along a short driveway between two rows of souvenir shops; this leads to the sheltered parking area, which has an outdoor pool at the back and the three floor, exterior corridor accommodation blocks around two sides. Guests can take advantage of several poolside cabanas, plus other amenities of coin-operated laundry, a business center and a gift shop. The standard free continental breakfast is prepared each morning. Travelodge Las Vegas Airport has a slightly out-of-the-way location along a side road adjacent to the west edge of the airport, 2 miles distant by road; in the vicinity are business premises and several other motels, though the Strip is only 0.7 miles away along Tropicana Avenue, and the southern terminus of the monorail at MGM Grand is half that distance, thus enabling easy travel to places further north. The motel is relatively large, with 106 refrigerator & microwave-equipped guest rooms, arranged along three sides of the parking lot, which has the office building and outdoor pool at the front. Airport transportation, wi-fi and continental breakfast are complimentary. Travelodge Las Vegas has a northerly location along the Strip right next to Circus Circus and just down the street from Riveria. Lodging is simple and affordable, albeit with a small number of amenities, principally free continental breakfast, free wi-fi and an outdoor pool, this fairly well shielded from the adjacent road. The 100 guest rooms are contained within a long two story building, and most face southwest. The Motel 6 is one of the closest properties to the international airport, adjoining the northwest perimeter. Highlight is a resort-style pool, contained within a secluded courtyard garden, and overlooked by some of the rooms. Accommodations are on two floors, accessed by exterior corridors, and most have views only of the parking lot and nearby buildings. The front of the motel is a quarter of a mile from the main entrance to MGM Grand, along Tropicana Avenue, and a similar distance from the nearest monorail station. Other amenities are wi-fi, free coffee and coin-operated laundry. Motel 6 Las Vegas offers budget-priced accommodations to I-15 travellers, located right beside the interstate at the Tropicana Avenue intersection, 0.8 miles from The Strip, the closest casinos being Excalibur and New York New York. The surroundings are mostly business/industrial though with a few restaurants nearby, including Denny's. Like most Motel 6 properties the rooms are on two storys, entered via exterior corridors, and amenities are limited to wi-fi, free coffee and an outdoor pool.